My posts have been lapsing lately due to the fact that I had a heart attack on September 11th. Yes, I had my own disaster on 9/11 and though it was not a national tragedy, it was a personal one. Because my attack came on due to a stressful situation, I had a lot of anger and anxiety building up within me. A good friend, Vivian T., suggested that I “paint” my heart attack. So at the first opportunity and when I was feeling somewhat better, I chose a canvas and some paints and began. My color choices were indicative of the anger and stress I was feeling and my strokes were long and swift. I made use of full arm movement with a large brush to lay down the first washes, working off some of the stress I was feeling. Cadmium yellow and cadmium red along with some titanium white and burnt sienna fit my mood perfectly and I was off to a great start. Next, I took a trusty palette knife and began scraping on more paint of the same hues, at the same time removing some of the previous wash that had not yet dried. Jabbing and jerky movements were used to relieve some of the anger I was feeling. This left some rather angry-looking strokes, reminiscent of the spikes on an EKG. Ah, this was definitely helping me come to terms with my situation. Then I used a chopstick to scribble some sgraffito lines into the composition, allowing some of the first layer to show through. This enhanced the painting and made me feel even better. By this time, I was feeling tired, but invigorated by the relief I was feeling. Painting seemed to melt away some of my angst and my stress level was improving. Sitting back and looking at the painting thus far, I felt that bit of red splattering might mimic the blood flow that is blocked off during a heart attack. So I grabbed a brush, loaded it with red paint and made a few, hopefully well placed, splatters over the painting. I was careful not to over-do this as I wanted my initial strokes and sgraffito to be at the forefront. 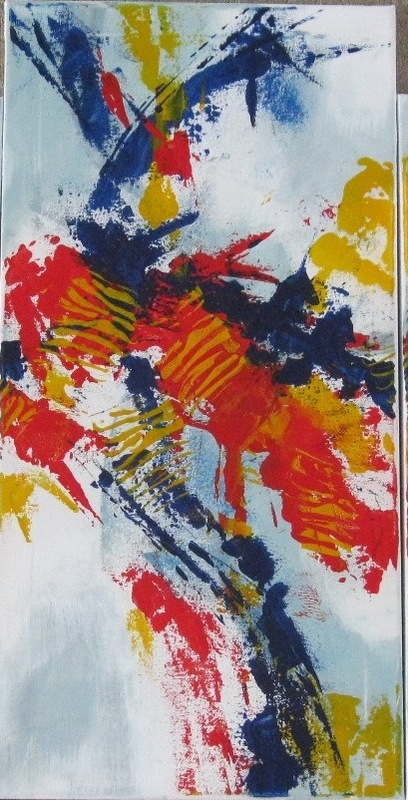 The splatters were made as an enhancement to the painting. Voila! Stress level decreased! Painting Finished! PS: Naming the painting was a tough decision. I felt that “Heart Attack” was too personal, too real. So I named it “Heartfelt.” I hope you agree. My love of what I call “Street Covers” began when I lived in an older part of Springfield. My daily walks around the area were enhanced by my love of the old architecture and plantings in the area. But the walk was becoming rather boring once I used to seeing all of this, beautiful though it was. 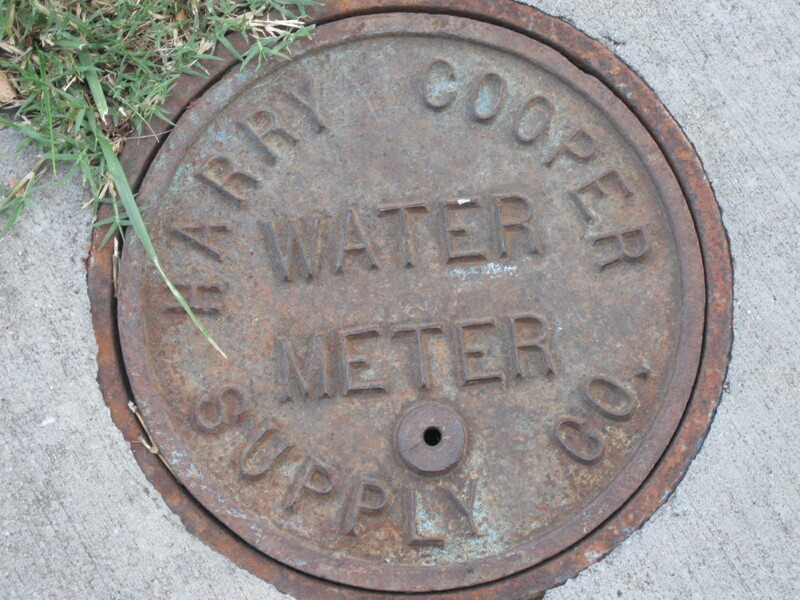 That is, until I discovered the wonderful design and textures of the water meter and gas covers placed in sidewalks and grassy strips along the streets. I began looking for different styles, sizes and designs in these lovely, but necessary covers. 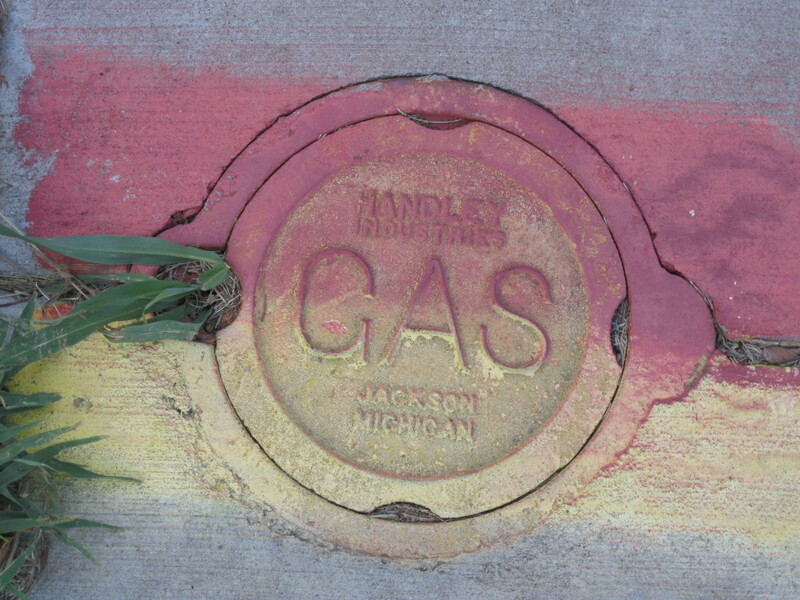 On my walks, I began taking a camera to photograph the street covers. Several photos of these lovely covers were added to my “inspiration” file for future reference. For several months, I tried to decide how to add some of these to my watercolors, which was the type of artwork I did at the time. But the industrial nature of the covers and the lovely flowing nature of watercolors did not seem to be compatible, and I could think of no way to effectively put them into a painting. Since then, my husband, Don, and I have moved twice and the idea was forgotten. But, behold!, when I began doing acrylic abstracts, I was searching my computer in my “inspiration” photos folder for fodder for another painting when I came across these lovely meter cover photos. 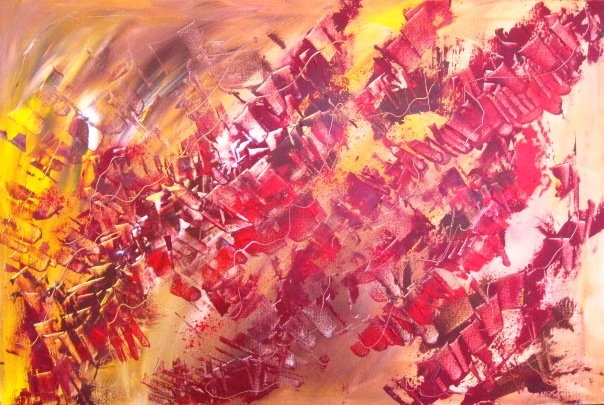 And I was thus inspired to try once again to insert them into a piece of artwork – this time a bolder acrylic abstract. 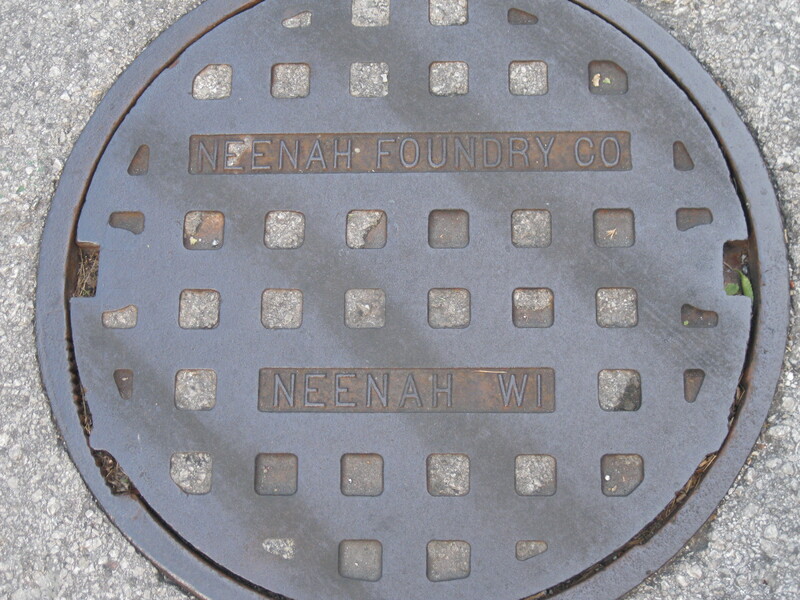 After walking the new neighborhood several times, I found several of the same meter covers I had seen on the north central side of town. Although there was more variety and many older, more interesting ones in our old neighborhood, the new neighborhood still had some very interesting covers….enough for an acrylic abstract collage. Finally, I remembered to take some parchment paper and a couple of sets of water soluble oil pastels along for the walk. I’m sure people passing by, as well as any neighbors who happened to look out thought I was slightly addled! I would sit on the sidewalk, or grassy area – sometimes even the edge of a lawn – place my parchment paper over the meter (after brushing and blowing away debris) and rub away with my crayons. 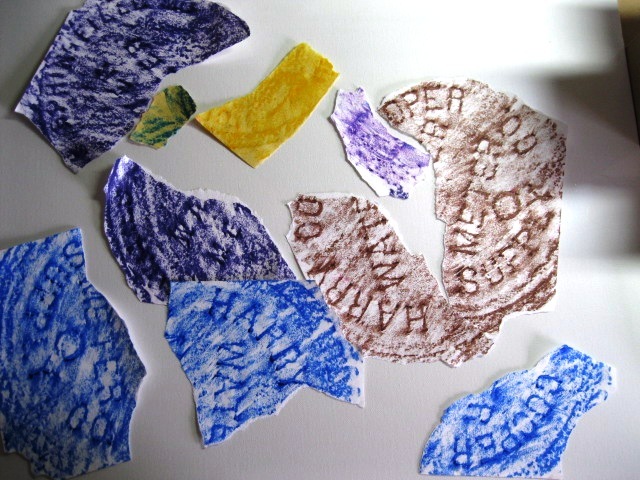 Several rubbings of street covers in the area were made in various colors. When I got home with my rubbings in hand, I took a 24×36″ canvas and, after tearing the rubbings into large and small pieces, began arranging them onto the canvas. When I was satisfied with the composition and color placement of the pieces, I photographed the canvas so I could refer to it when gluing on the pieces. 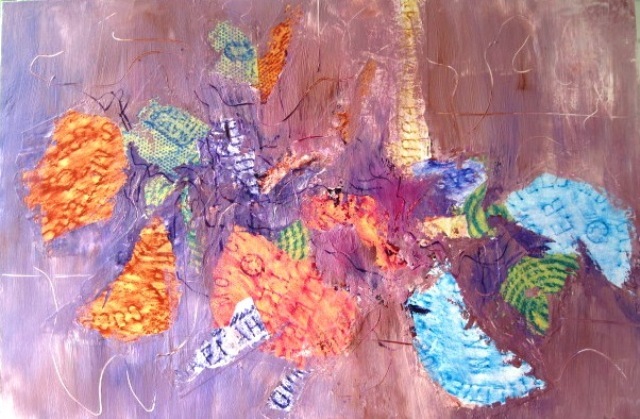 The torn rubbings were removed and my photo was used to place and glue the pieces onto the canvas. 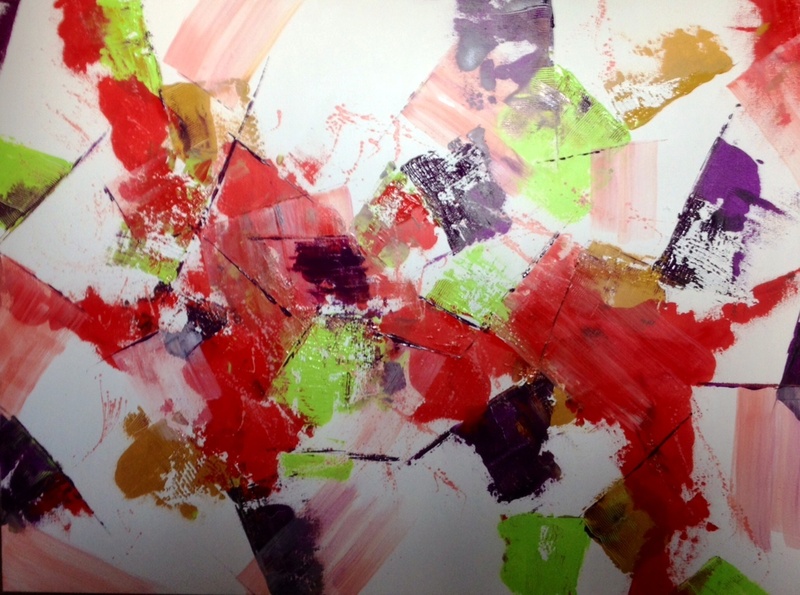 Left to dry overnight, the collage/abstract acrylic was ready for some acrylic painting. I decided to mix some colorful grays to simulate the sidewalks in which many of these street covers had resided. As you can see in the final painting at the top of this post, these grays ranged from a cool lavender to a warmer mix with some burnt sienna in it. The edges of all of the collage pieces were covered with paint to help make sure they were integrated into the painting. When finished, the painting was left to dry for several days before receiving a couple of coats of UV protective spray varnish. There you have it! Fractured Utilities – an inspired colorful acrylic abstract collage of street covers. Whenever I get a new canvas, especially a large one, I cannot wait to splash some paint on it. 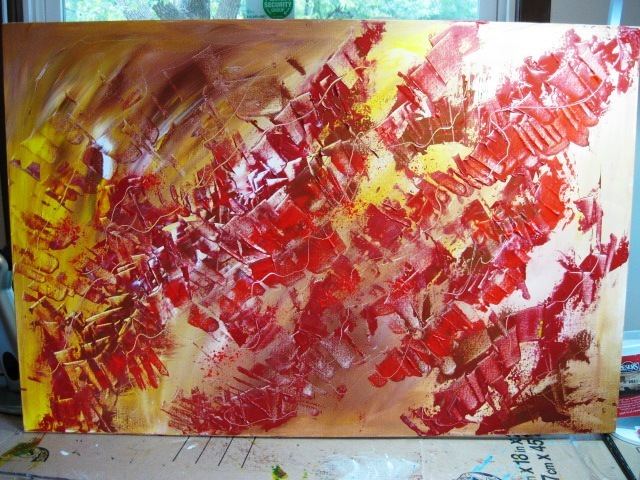 So when I recently bought two 36″x 48″ canvases on sale, it didn’t take me long to decide to create another abstract. Because my Jubilation abstract painting has received some local attention recently, I decided this canvas of the same size should have a similar feeling. Though the final results of Revelry are similar to Jubilation, different colors were used but I kept the predominantly white background. 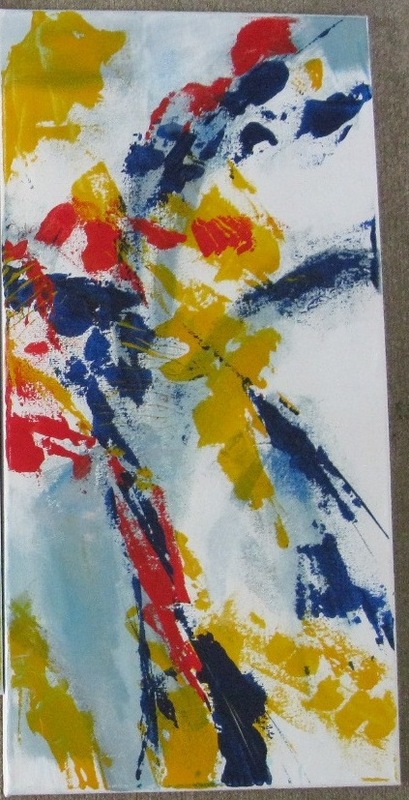 The acrylic abstract, Revelry, began by drawing out a small, rough plan for placement of the shapes. 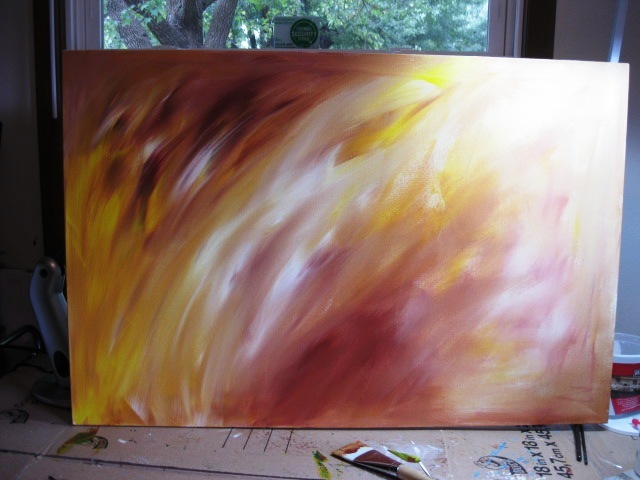 I then decided on the colors I wanted to use – yellow green, violet, yellow ochre, and cadmium red. Then I started putting some texture on the canvas. A mixture of stucco patch and white glue gives a wonderful, gritty texture and adheres well to the canvas. This was scraped on with a palette knife onto various areas, loosely following my drawn design. Then a notched spreader was used to define the texture even more in some of the areas. This texture was then left to dry overnight. The following morning, a coat of titanium white acrylic was painted over the entire canvas. Because I knew the 1-1/2″ wide edges would be white, I painted them at the same time. Once that was dry, the fun of painting the brilliant acrylic colors began. Since I paint quickly, I often do not have time to photograph the various steps I take when painting, though I often wish I had done so. That was the case with this abstract piece of art; everything was going so well, the music was energizing, and I was really enjoying myself, so no photos in progress were taken. My plan for this particular abstract was to begin painting with the yellow green, then add the yellow ochre, then red, then the violet. A large palette knife was used and I followed this color order when painting. The texture I had placed helped guide me as to where the various shapes would be. In some areas I covered the texture with paint; in other areas, I skimmed over the top of the texture to make it more prominent. When this part of the painting was finished and all of the colors had been used, I moved the painting to an upright position, stepped back and surveyed the results. “Not a very good painting,” I said to myself. So I thinned some titanium white to make an almost transparent wash, added a pinch of the red acrylic to it and used a large brush to paint rectangular shapes that I believe helped to make it more cohesive in design. I also added just a few splatters of the same thinned paint to some of the areas to give a subtle feeling of movement. Not quite right – what does it need? So, I grabbed the tube of violet acrylic, squeezed it onto the large palette knife and made a large stroke from about mid-point on the left, down to the bottom edge of the canvas. Better, much, much better, I thought. Adding this larger strip of purple was a nice contrast to the many smaller shapes of the abstract and helped to balance it out. 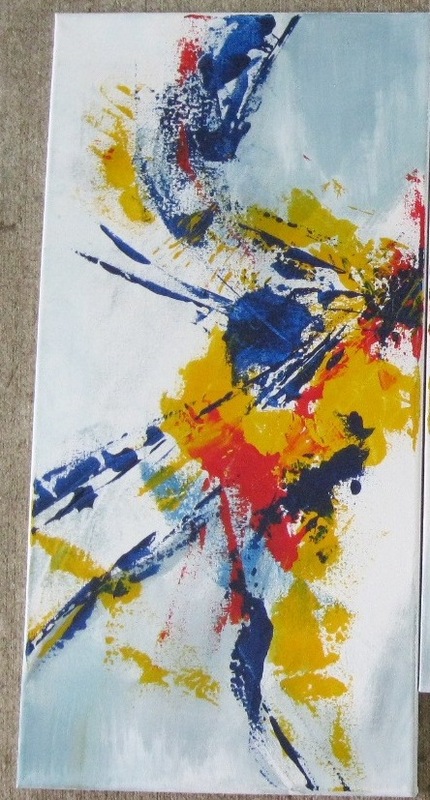 Again, I placed the abstract acrylic in an upright position and looked at it. I took it from my studio into the living room and propped it up there. Though I wasn’t happy with the choice of the yellow ochre, I decided to leave it alone. It wasn’t that much of a distraction and trying to “fix” might destroy the whole painting. But the little violet spot toward the middle of the painting and just to the right of my large “swoosh” seemed to draw my eye unmercifully towards it. It had to be fixed, but I wasn’t sure what to do with it right away. So the painting went to bed for the night – as did I. The next day, Revelry was again surveyed and that little spot was still undeniably distracting. Again I put some violet acrylic on my large palette knife and made the spot a bit larger. Oh, wow! I said, That’s it! My “Daredevil’ approach worked and Revelry is complete! Several members of Studio 55 have been working hard over the past several weeks – and months – to get ready for our Second Annual Fall Art Exhibit and Charity Silent Auction. This is an annual event sponsored by Studio 55 Fine Arts Guild, National Avenue Christian Church, and National Art Shop. This year’s sale of artwork from our exhibit and silent auction will benefit two local charities – Crosslines and Rare Breed Youth Services. This is a really fun and inspiring event and is definitely for a good cause. This past Thursday, August 27th, various artists from Studio 55 brought their artwork to National Avenue Christian Church, where the exhibit will be held in the church gallery. 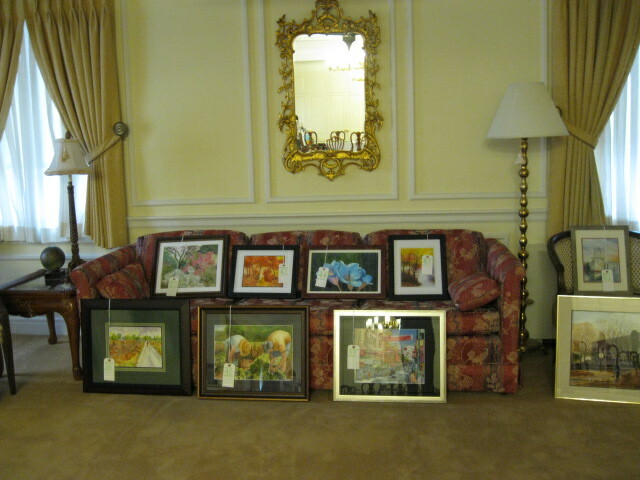 Forty artists brought in almost 75 pieces of artwork to the gallery for this year’s exhibit. I was kept busy collecting the exhibit fees and entry forms, counting the easels that were brought in, getting artist’s releases signed, and directing people. Several other Studio 55 members made sure the artwork was labeled, the wires were attached correctly, and placed numbered and color-coded tags on each piece for judging purposes. They also verified that the medium the artist used was documented, as well as the sale price and titles of the artwork were correct. Several people acted as “runners, ” taking the artwork from our check-in spot in the gallery of the church down the hallway to the church conference room. We had started before 9 a.m. checking in artwork and by 10:30 a.m., I estimate that 90% of the artwork had been delivered. 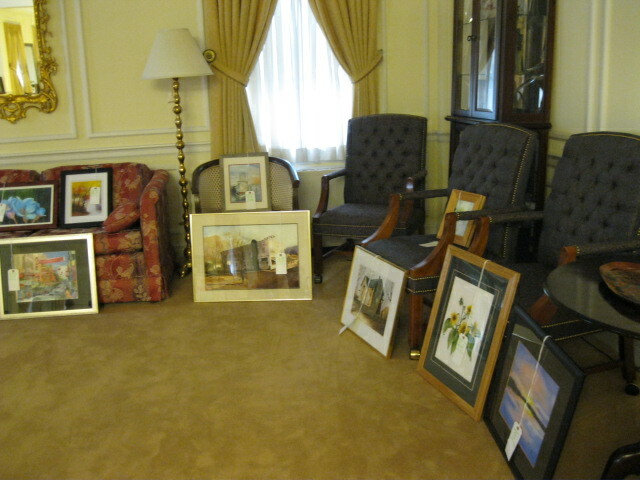 By noon, all the artwork for the exhibit had been delivered. 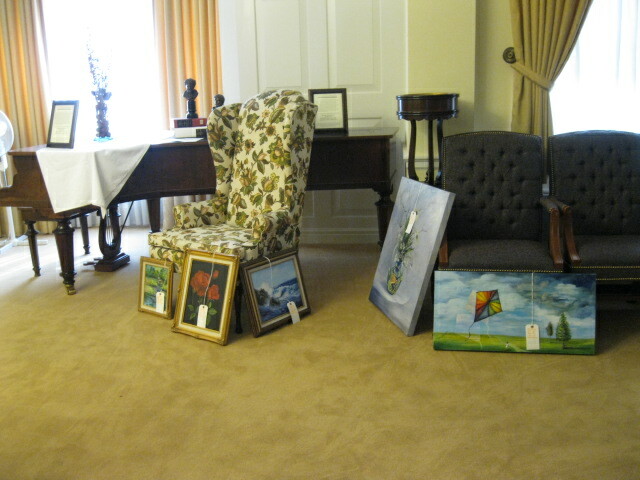 Items for the silent charity auction were brought in at the same time as the artwork. More Studio 55 members were in charge of taking in the donated items and placing them on the auction tables. 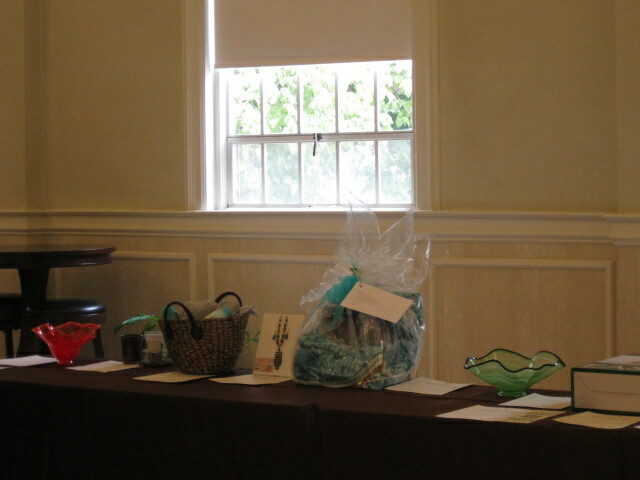 Many wonderful items will be available for bidding, all very generously donated by area merchants and individuals. The people taking the donations made sure the item was correctly marked and that a bid form was created for each donation. 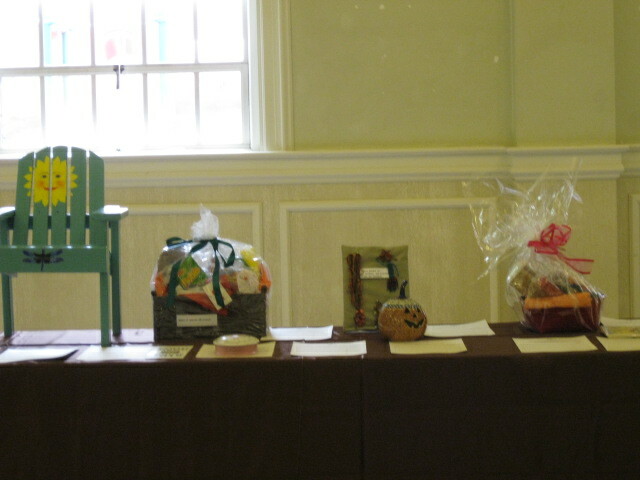 These items were displayed on the silent auction tables which were set up around the perimeter of the gallery. At noon, Studio 55’s President, Sandra Letson, brought lunch for the volunteers who were still there after all items had been received. Lunch was from Bambino’s, a wonderful Italian restaurant here in Springfield. The sandwiches, soups and pastas she brought to us were thoroughly enjoyed. A nice reward for all the work we had done! At 1:00 p.m., Betty Shook, art appraiser and owner of Betty Shook Interiors, as well as the judge for artwork displayed at Waverly House Gifts and Gallery, judged our artwork. She walked around the room and viewed the 5 categories of artwork – Acrylics, Oils, Watercolor, 3D, and a mixed category of Photography, Pastels, Pen and Ink. Betty took notes and made her choice of a first and second place winner, as well as an honorable mention, for each category. Winners will be announced at the Benefit Auction and Exhibit Reception, which will be held September 4th from 6 to 8:30 p.m. Everyone is invited to attend and see the wonderful artwork and bid on the silent auction items. Refreshments will be provided. 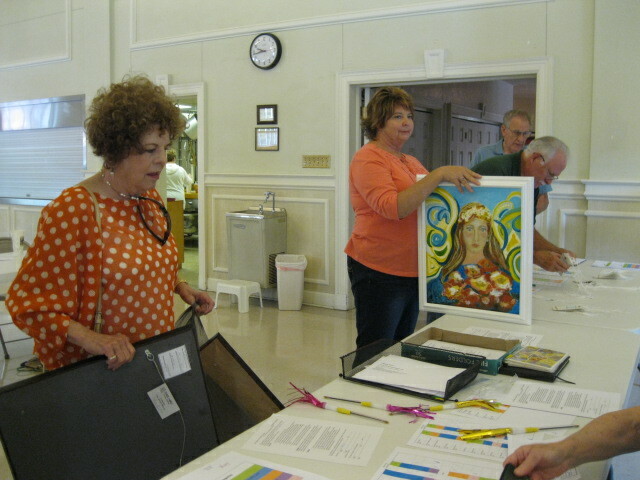 The following day, Friday, August 28th, several Studio 55 volunteers were back at the church and working hard again to get the paintings displayed on easels and hung on the 3 large panels, as well as putting some of the artwork and 3-D art on pedestals. This took us about 2-1/2 hours or so to get everything hung and displayed to our liking. We all agreed that this process went well and we all were satisfied that our exhibit will be a wonderful one. In future posts, I plan to describe some of my thoughts and processes for the various abstract acrylic paintings that I have done in the recent past. But today, I decided to post one of my newer paintings which is a triptych entitled “Treasures I, II and III. 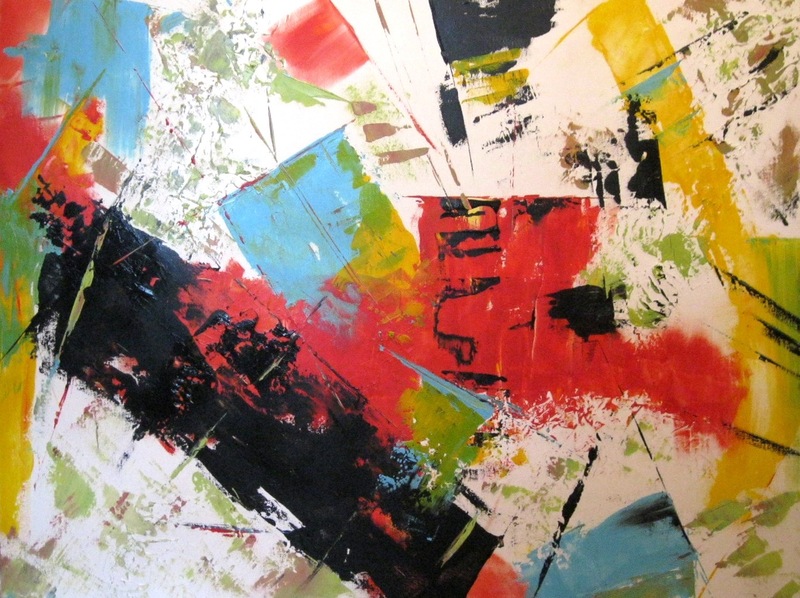 This painting was inspired by music by Van Halen. The rhythms and tempo helped to make my brushes dance on the canvases and, I must admit, made me dance a bit too! First, I aligned the canvases with the center canvas 3″ above the other two. I prefer to work on a flat surface so they were laid flat on my table. I marked the edges of the two outside canvases with a pencil mark 3” from the bottom to help me keep them aligned as I painted. While standing at my table and listening to Van Halen, I chose my colors – brilliant ones to suit the mood of the painting. But I wanted a more grayed background, so I brushed the canvases first with white, then a mixture of the 3 colors plus white to form a grayish pattern across the three canvases. Then I switched to one of my favorite large palette knives. Paint in three bright primary colors was knifed on and my design “happened” as I listened to the various beats of Van Halen. I loved the way the brilliant colors popped on the canvas. The energy of the melody inspired the composition, although I always keep in mind where I want the viewer’s eye to flow. I also paid attention to keeping the three canvases consistent and cohesive. But yet I wanted each canvas to stand on its own with good composition, design and focal areas to keep a viewer interested. To illustrate, I’ve posted each section separately – feel free to let me know if I met this goal of keeping them individual, yet connected. When I felt there was nothing more the painting needed, I stopped and propped the paintings up on the floor in my small art room, sat back and studied them. Then, because I always want a second opinion, I took them into the living room and propped them against a piece of furniture for my husband to view. He always says he likes my paintings and that they are wonderful, but sitting next to him on the sofa and looking at them always gives me a new perspective. Hearing his comments also helps me get a feel for how others will view the painting. Looking at it now, I decided that the far left painting needed more blue and that the flow was not as I wanted. So back to my “studio” I went and added a few more strokes of blue with my palette knife. I also decided more texture was needed to bring the painting to fruition, so I took a small stencil and placed it over the mid section of the three paintings. Then I scraped yellow paint over the stencil with my palette knife. Aha! That did it….the painting was finished. Once the outside wrapped canvas edges were painted (in white) and the paint had cured for several days, I photographed the paintings. They were somewhat difficult to photograph as I wanted them aligned the way they should be displayed. Putting them on an easel to photograph did not work. So they were laid on the concrete floor of the sun porch and pictures taken there. It was quite difficult to get a correct perspective on them, so the photo posted above is not the best. If any readers have a sure-fire way of photographing these, other than displaying them on a wall first or hiring a professional photographer, please let me know. Finally, varnish was applied to seal the paintings. I do this on our wonderful little sun porch at the back of our house. (Thanks to my husband and his brother for building it there this summer!) There is wonderful ventilation with all the sliding doors open, so it is a perfect place to seal my paintings and not worry too much about fumes. I also photograph them there and the lighting is perfect if I choose the right kind of day – sunny, but slightly overcast works best for me. 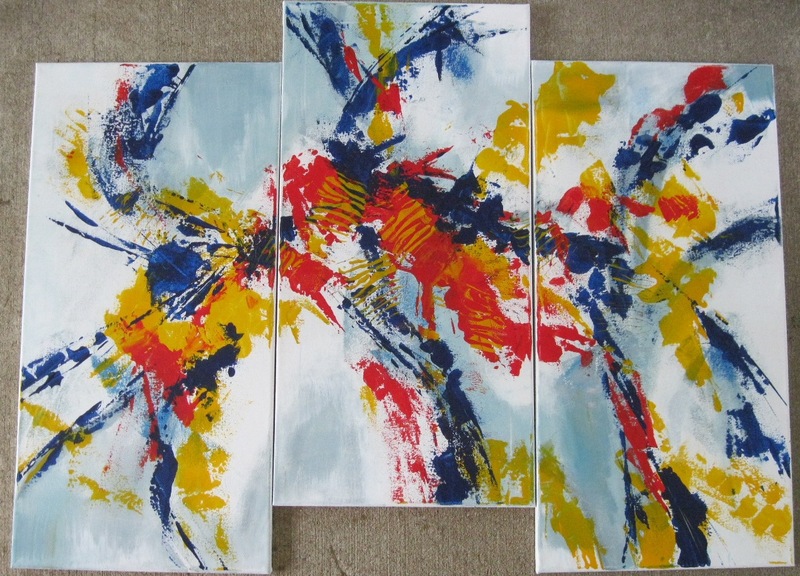 This abstract acrylic triptych painting was accepted and is currently displayed at The Buzz, a wonderful cafe here in Springfield, Missouri. It is such an honor to be one of the featured artists there and I was thrilled to be accepted. Many artists are showcased at The Buzz (also known locally as B3) on a rotating basis. Each artist’s paintings stay up for a couple of months, there is a lot of customer traffic there so an artist exhibiting there can get some wonderful exposure. This is my first-ever post to present my acrylic abstract artwork to the world! My art journey began in 2009 after a disabling back problem forced me to quit my long-term career in the healthcare industry. I had been first a Coding Manager and then a Corporate Compliance Manager for St. John’s/Mercy Health System – the second largest in Missouri. Having had back surgery, followed by failed back surgery syndrome, I was “stuck” at home, perhaps wallowing in my own misery. To keep myself occupied, I took a trip to our local art shop and purchased a small watercolor kit. It contained everything I needed to get started – except inspiration! Books were borrowed from the library on watercolor and art, online videos were watched, followed by myriad purchases of books and DVD’s to further my basic understanding of the “rules” and how artwork should be done. Workshops that were given in our area were helpful and inspiring, as well as a few on-line classes and an adult evening class at our local community college. 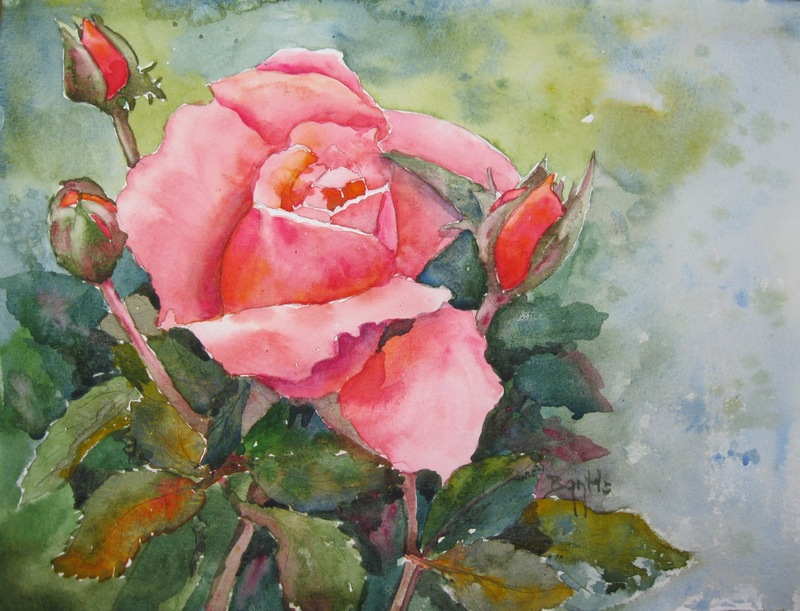 After painting watercolors for a few years, in 2012 I joined Studio 55 Fine Arts Guild, a group of fantastic artists who are age 50 and older. I entered several of their sponsored exhibits and continued my journey into watercolors. 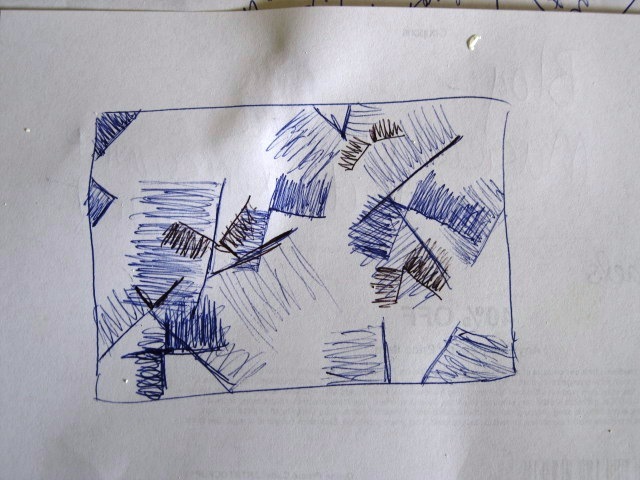 In May of 2015, I attended a workshop given by abstract expressionist artist, Elizabeth Chapman, who lives in our area. 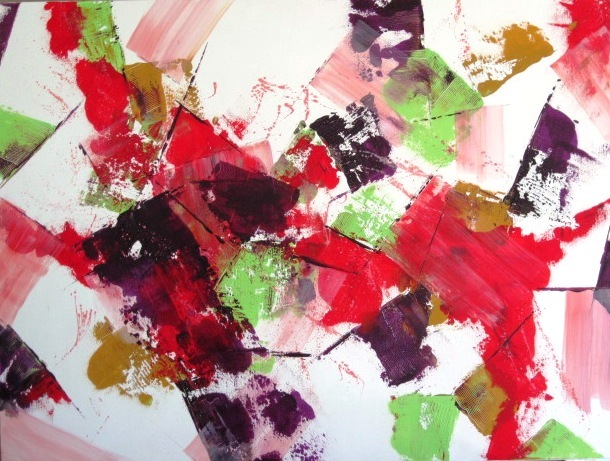 She paints wonderful abstract paintings, often listening to music for inspiration. Since this workshop, I have not painted even one watercolor! 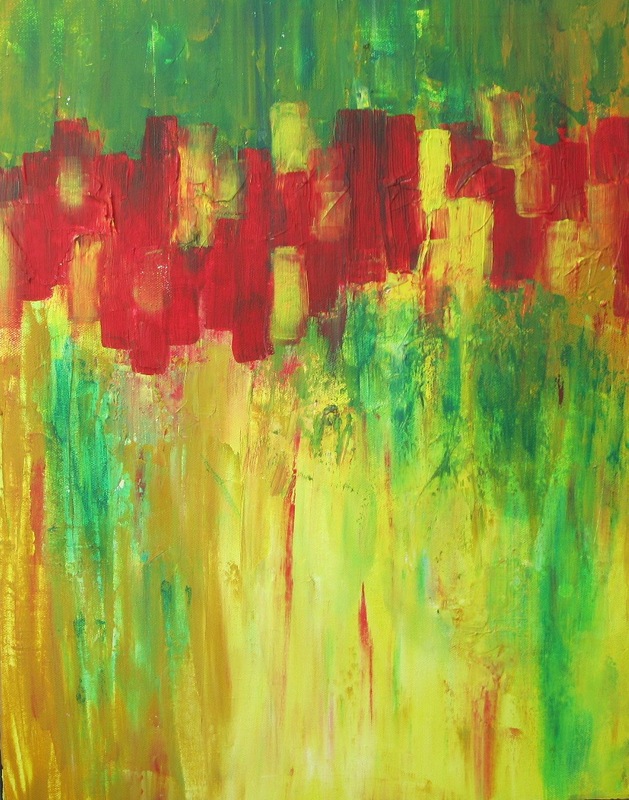 When I began doing abstracts in earnest, my whole demeanor changed. 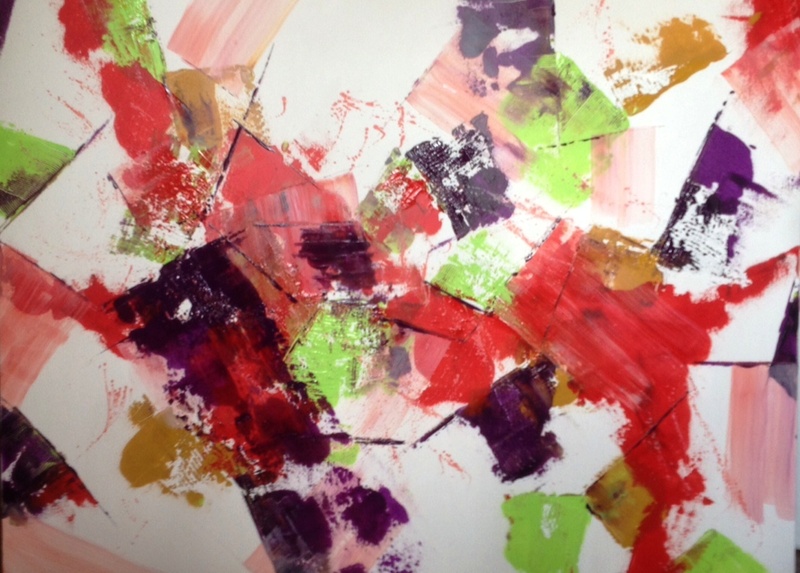 Instead of being introspective – perhaps from being bent over a piece of watercolor paper for way too many hours – I became more outgoing, some might even say “flamboyant.” Instead of a beautiful watercolor of lovely flowers, I was painting to music, using large canvases, splashing paint and using brilliant acrylic colors. Instead of striving for painting a loose feel to realistic subjects, I used my imagination, let the paint flow and was very happy doing it. No longer was I bent over a piece of watercolor paper, I was standing up to paint and moving around. I found that my back pain became less, though I still must take frequent breaks. Special friends from Studio 55 took particular notice of my change in art style and medium, as well as change in my attitude. They have encouraged me to keep it up and so I have done. With their help, I now have several paintings displayed at two of our local cafes, along with several other local artists. This particular painting, Jubilation, has been published in a couple of local magazines, as well as our local newspaper to help advertise Studio 55’s Fall Exhibit and Charity Auction which is being held in September. I am so thrilled and proud to be featured in these publications and at the cafes. 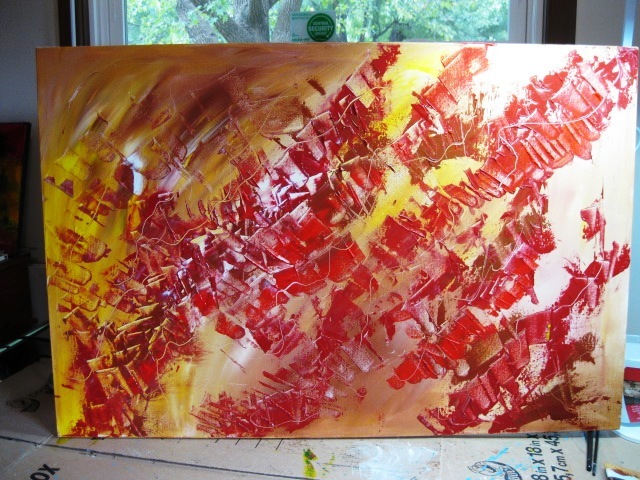 And at long last, I have found my niche – large, expressive abstract acrylic paintings.